Here at Interloft we are the experts at designing and creating beautiful loft conversions, and this includes the installation of the incredibly popular dormer conversions. Dormer loft conversions are characterised by a dormer window – a vertical window which projects from the slant of your roof – and our experts are capable of fitting these windows to the most superior standards. Dormer conversions are very beneficial as not only do they completely enhance the available space in your loft, increasing the head height dramatically, they also add character, value and improve the external appeal of your home. 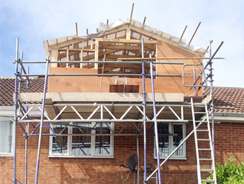 Our specialists work with you throughout the entire dormer loft conversion process, providing a completely project managed service, so you can rest assured of a finished result which meets your needs and reflects your tastes and budgetary restrictions. With over 15 years of experience, you can rely on the team at Interloft for the highest quality workmanship. We are based in Tadcaster and cover the Yorkshire region, conducting high-end dormer loft conversions at competitively low, cost-effective prices. Simply get in touch today for more information!